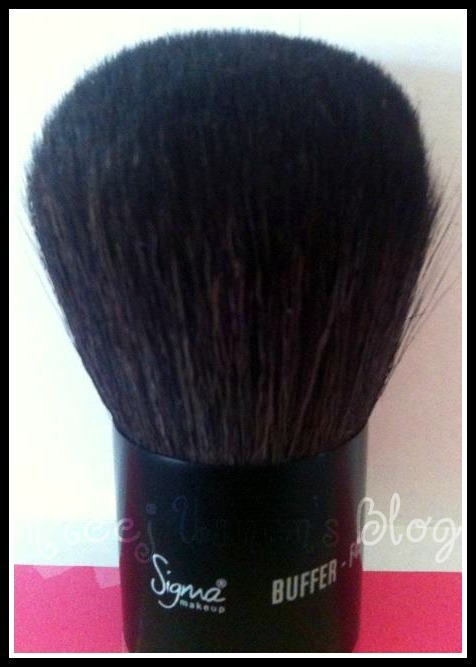 Today I am reviewing another make up brush from SIGMA. Who hasn’t yet heard about SIGMA Brushes.I guess everyone who is into make up knows that SIGMA creates lovely and quality makeup brushes that one can use regularly and these are also reasonably priced,so that it wont be heavy on anyone’s pocket! 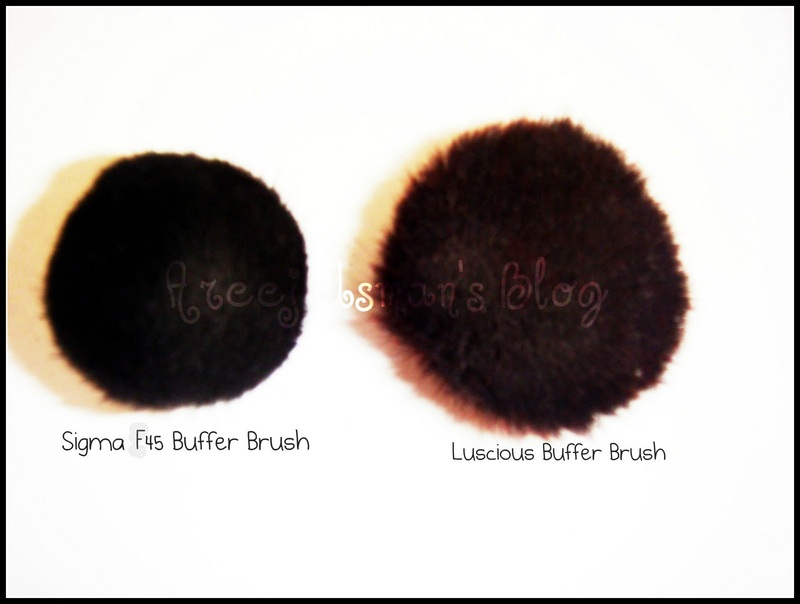 The brush that I am going to review today is the SIGMA F45 BUFFER BRUSH.I received it a few days earlier in the mail from Sigma and today I am presenting my review. 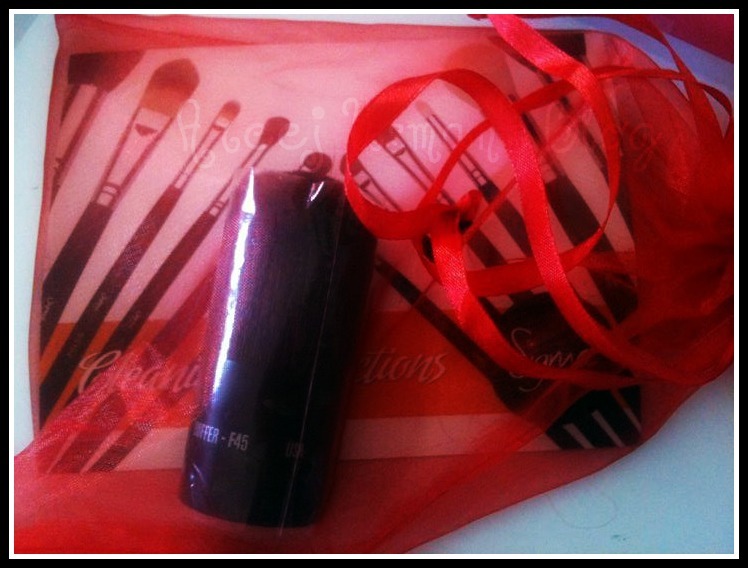 First of all as usually SIGMA’S Presentation is great.SIGMA knows how to make one feel special everything we get something from them.The brush came in this lovely red pouch that can be used to store make up,jewellery or any precious stuff later on. 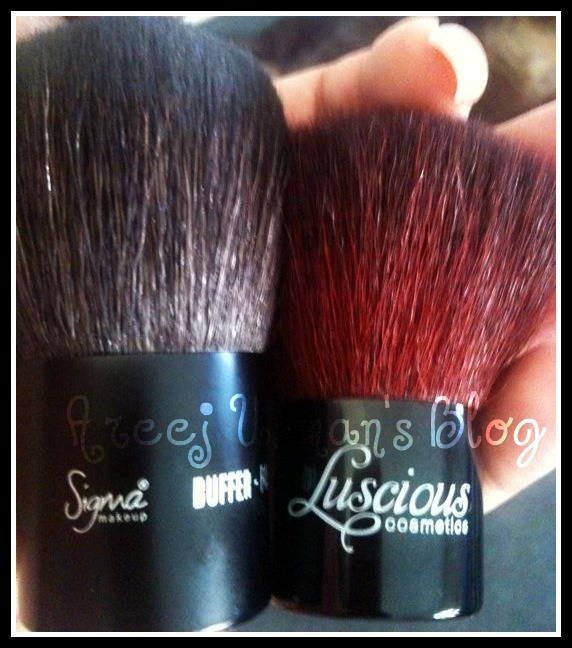 Secondly I want to compare SIGMA F45 with another Buffer Brush that I have from Luscious cosmetics. At the first look at SIGMA F45 we may exclaim what a small sized brush but them if we compare to others such as Luscious we may see that it not that small.The size is quite reasonable but handy to use. Similarly another good thing about the F45 is that its bristles are very tightly packed and so it picks some pretty decent amount of powder or product in one go.A view from the top can show us the density of both the brushes. 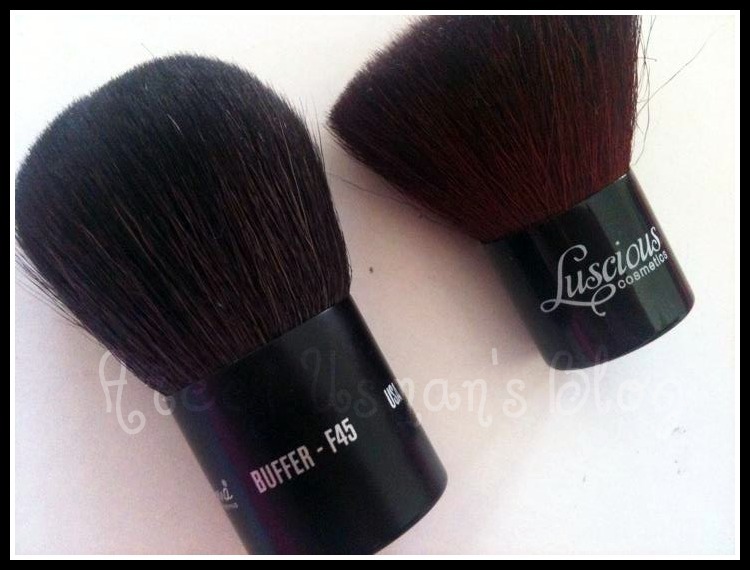 I can say that the SIGMA F45 nearly has the same purpose as Sigma’s Miss Taylor Kabuki.It can be used mainly for powder products like mineral or powder foundation,similarly other mineral products like blusher and other highlighters and bronzers.I used this to blend my mineral powder.The purpose of this brush is to give a buffed and smooth finish at the end and that it certainly does and give out a smooth and even look to the skin.The feel of the bristles is very soft on the skin.I have noticed some shedding of the bristles but that I think is not a problem as long as the brush does all the good work. This brush is priced at $19. If you want a good buffer brush for your collection and you are looking for a cheap alternative to other branded expensive brushes then go on and order this for yourself.It wont disappoint you at the end. You can order the brush from SIGMA here. For more details visit SIGMA BEAUTY.You can also find them on Facebook & Twitter. PS.I am also having a Giveaway for the brush that ends in 3 days.If you want to enter click here. 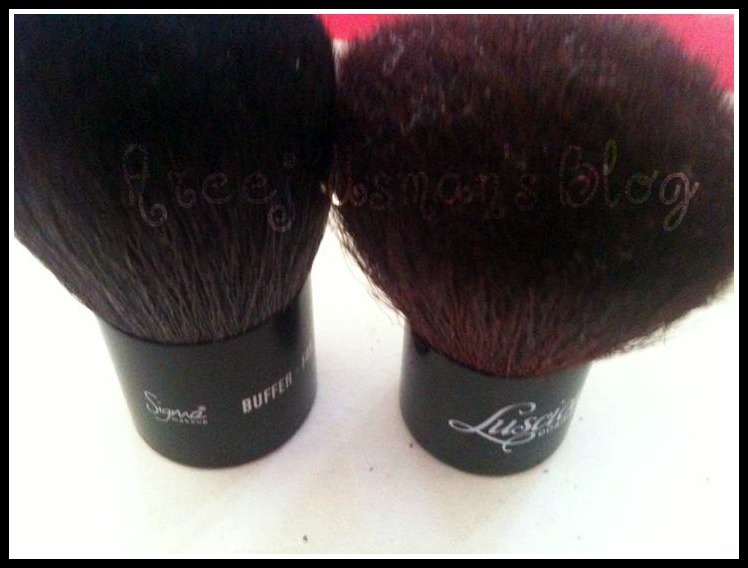 WINNER OF THE SIGMA F45 BUFFER BRUSH….. I have this too and I love it even thought it does pick up such a big quantity of product, I'm always scared to overdo my blush and bronzer LOL!